Upcoming Autograph Signings, Sports Memorabilia Sales and Promotions: Time to Stock Up on Steiner Gift Cards!!! Time to Stock Up on Steiner Gift Cards!!! SHHHH... Don't tell anyone that you can now purchase a $75 for a $100 gift card! $200 for a $250 gift card! NO PROMO CODE REQUIRED. Just add the $100 and/ or $250 gift card to your shopping cart to see the discounted prices. Prices are good through December 19, 2014. It's a great time to stock-up on gift cards and use them throughout the year. 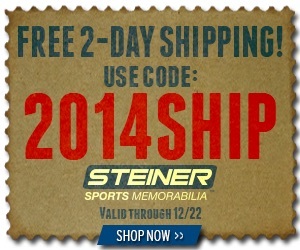 Visit Steiner Sports Gift Card Center to take advantage of this great deal.